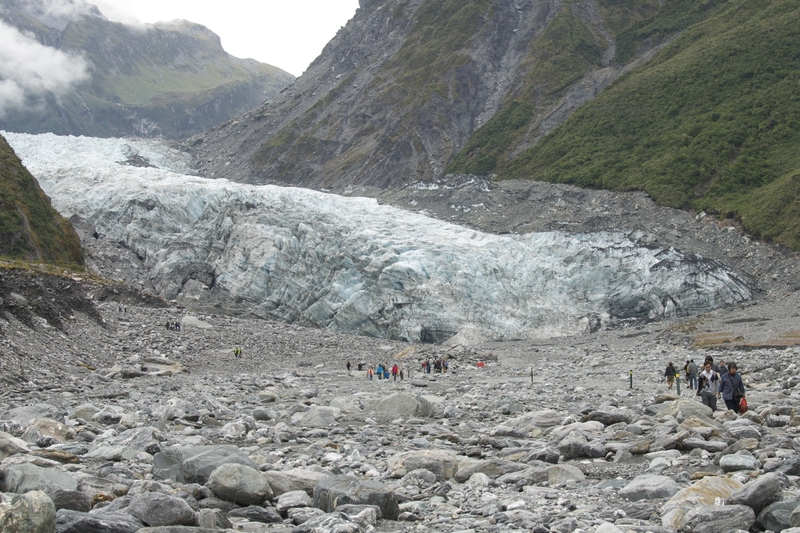 Franz Josef glacier — simply massive. A lot of people know that New Zealand’s official weather data show that this country’s mean temperature has remained remarkably stable for at least 150 years. The warmsters have been squawking at us since the IPCC was founded in 1988 for using abundant, affordable hydrocarbons to power engines and to create all kinds of materials, from the ordinary (like tar and ink) to the fantastical (like heart valves and aspirin). They demand we stop drilling anywhere, stop mining anywhere and stop creating affordable products to improve and save lives. But this is blinkered madness oozing from the dystopian IPCC stink-tank. Who wants to write a letter? Once again, Campbell Live runs an alarmist piece on disappearing New Zealand glaciers. Tonight they featured a climate scientist from Victoria claiming “climate change” is affecting the Franz Josef glacier. It has retreated over the last few decades. Why is Greenland losing ice? New report seems to assume it’s melting, but is it? Greenland is the world’s largest island, about 2600 km long and 1100 km wide at its widest point. 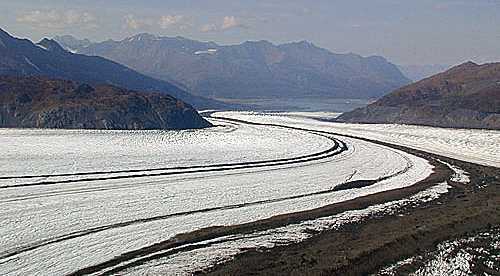 Most of the interior is covered by the world’s second-largest permanent ice sheet. Average temperatures rise above freezing only briefly, during the summer. 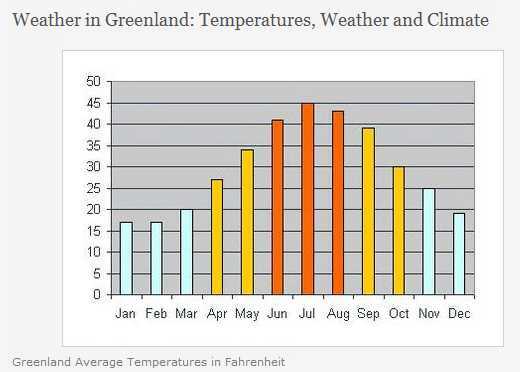 Here’s a simplified graph of monthly temperatures taken from a tourism site. that’s right, most of the year! 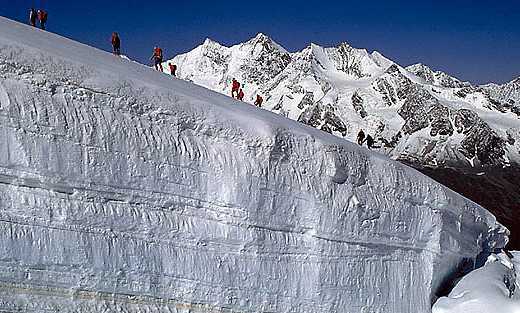 An impressive glacier formed from firn (FIRN), a Swiss-German word meaning “last year’s snow”. Note the clearly evident layers and, for a sense of scale, the people walking on the glacier, which is formed simply from fallen snow. Each distinct layer of firn contains a slightly different contribution from the atmosphere. Here’s a thread to discuss the migration of gases (or not!) through firn, or old snow, and the ramifications for past levels of atmospheric gases. When I discover how to move comments between threads, I’ll add the relevant comments from other threads. A gigantic glacier. Glaciers such as this sneer at temperature rises. They laugh at warm periods and demolish heat waves. However they pine away for lack of snow. This unknown glacier in Alaska is part of a system that covers many kilometres. Hot Topic has just released a rant against Barry Brill’s article “Crisis in New Zealand climatology”, just published at Quadrant. Readers here, waiting for NIWA to release the reasons for the adjustments to the official national temperature record, will be pleased to learn that Renowden has the answer so NIWA needn’t bother with all that scientific mumbo-jumbo. First he quotes Barry’s article pointing out that the average NZ temperature in the 1860s was 13.1°C, the same as the average temperature in 2005. Renowden scoffs at this but does not refute it. I find that strange. He has no argument with those facts. He lets them stand. Global warming first: oxygen involved! The mighty Merz Glacier. When sea ice fills this area after a piece is knocked off and floats away, why and how is the freezing of the water influenced? A massive iceberg struck Antarctica, dislodging another giant block of ice from a glacier, Australian and French scientists said. The end of the mighty Mertz Glacier had been repeatedly hammered by the 97-kilometre-long iceberg as it moved in the ocean currents. Note that there’s no mention of global warming to explain this “breakup” of ice. One wonders whether Rintoul is accurately quoted. It is understandable that the overturning circulation might transport water of differing oxygen levels around the oceans, but it is incredible that differing oxygen levels might affect the overturning circulation. I do not understand how observing the effects of oxygen on the overturning circulation might have any effect on our predictions of “climate change”, much less allow us to improve them. Further explanation is required, and it ought to have been obtained by our beloved Herald before publication of this nonsense. This is a good summary of the Himalaya glacier story. Jonathan Leake and Chris Hastings, at The Times Online, go through the details and discuss the implications. The IPCC tell us constantly that they use experts in every field to assemble its reports. It’s scandalous that any of their teams might be led by a person who could know so little that this kind of school-boy error is possible. Their reputation is getting worse by the day. At this rate of thinning, the glacier could disappear in 100 years, instead of the 600 years earlier estimates had suggested. Some people are never satisfied, are they? Reuters reports that, after centuries of praying for a local glacier to stop growing, some Swiss villagers are now seeking an audience with Pope Benedict to get his blessing for prayers against the global warming that is causing it to recede. In 1678, the inhabitants of the Alpine villages of Fieschertal and Fiesch made a formal vow to live virtuously and to pray against the growth of the Aletsch glacier, Europe’s longest, which had caused a lake to flood into their homes. To reinforce their prayers, they started holding an annual procession in 1862, when the glacier reached its longest during the mini-ice age Europe suffered in the mid-19th century. But the villagers now want to seek permission from Pope Benedict to change their vow as the glacier is melting fast due to climate change and have requested an audience with him. “The residents of Fiesch and Fischertal hope that this will happen in September or October and are optimistic that the Holy Father will decide in their favor as he has repeatedly spoken out about climate change,” they said in a statement. Switzerland’s glaciers shrank by 12 percent over the past decade, melting at their fastest rate due to rising temperatures and lighter snowfalls, a recent study showed. Oh, a study? Who did it, what does it say? It’s not important enough to tell us, apparently. It is surprising to hear that a slightly falling temperature has been melting the glacier. Those who know a little about glaciers and where their mass comes from will consider it much more likely that the reported “lighter snowfalls” are in fact responsible for its reduction in size. It cannot have been higher air temperatures, since temperatures have been going down slightly. Reduced precipitation, on the other hand, will inevitably cause the glacier to slow down through being lighter. It would be interesting to know if the “study” actually said that all of Switzerland’s glaciers shrank by 12 percent. Odd if they all suffered exactly the same reduction all at the same time. Switzerland’s a big place. Lots of different climate situations. But who am I to dispute it? After all, they did a “study”. The big implication is that human activities are responsible for all the nice glaciers melting. How, precisely, do they link the melting to anthropogenic carbon dioxide? During a period of declining temperatures! They cannot. It’s outrageous to imply it.